The Chrysler Pacifica has been the most awarded minivan three years in a row and for good reason. This minivan has the technology, performance and safety to outshine any other minivan in comparison. There is no other vehicle to match for your family in entertainment and comfort. Keep reading to learn about the newest features. Check out the newest leasing and financing options to get yourself a new Chrysler Pacifica. Our staff here at Palmen Motors can help you with all of your questions to get you driving home in the new Chrysler Pacifica. We are proud of our very best in class customer service and will work with you to find an option to meet your budget and family’s lifestyle. Safety always come first. That’s why the Chrysler Pacifica offers so many safety features ranging from parking assistance to frontal and side curtain air bags. ParkSense front and rear park assist, Parallel and Perpendicular Park Assist, Rear Cross Path Detection are just some of the parking assistance features available. Chalking up to 28 highway miles to the gallon, the new Chrysler Pacifica has a 3.6L Pentastar V6 engine to efficiently get you places. The Chrysler Pacifica provides a best-in-class maximum towing capacity of 3,600 pounds to help you tow your gear to your next destination. 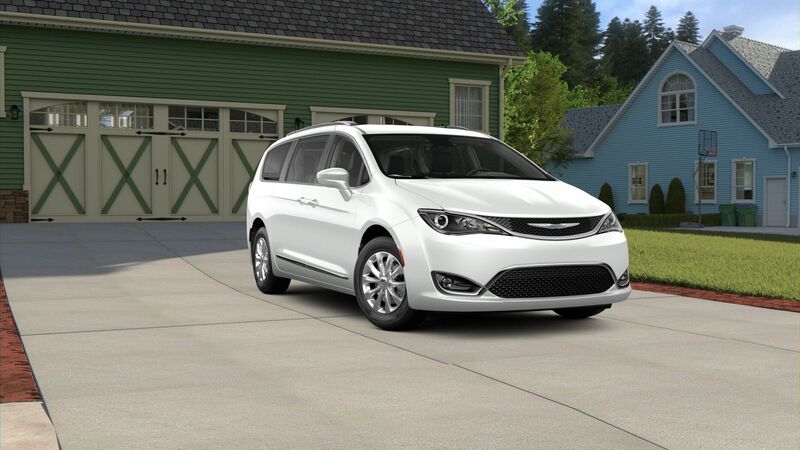 We love convenience and the new Chrysler Pacifica is happy to supply that. Featuring an 8.4-inch touchscreen with customizable home screen, you can link up your smartphone to enjoy streaming audio. The Chrysler Pacifica comes with the best entertainment system for families. The Uconnect Theater has a host of interactive apps and games that includes: License Plate Game, Backseat Bingo, Are We there Yet and Math Flash Cards. Uconnect also allows you to make and receive call, send texts, and listen to your own music. .
New to the minivan family is the Chrysler Pacifica Hybrid. With a 32-mile electric range and up to 82 highway miles to the gallon, you and your family can go the extra mile. There’s options for regenerative braking or you can amp it up with a 240-volt Mopar charger.